No matter how good the camera on your phone is, it can only help you capture video from a single perspective at a time. Wouldn’t it be great if you could shoot from multiple angles and stitch it all together? That’s exactly what GroupClip is about. This free iOS app turns you and your bunch of mates into a collaborative film crew by letting you shoot video and bringing all those clips together into a single easy-to-use editing interface on your phone. Say you’re at a skate park and want to capture a sick trick. All you need to do is position your friends around the skater and have them film it with GroupClip. When everyone’s done shooting, you can connect to their phones over Wi-Fi or a cellular connection to grab their footage. Next, simply load their clips and stitch shots together by simply tapping to switch between cameras. The editor is flexible enough to create clips showing a single camera at a time or display mutliple perspectives at once in a collage. And if you’ve got DRM-free music loaded on your device, you can use it as a soundtrack for your multi-angle video. 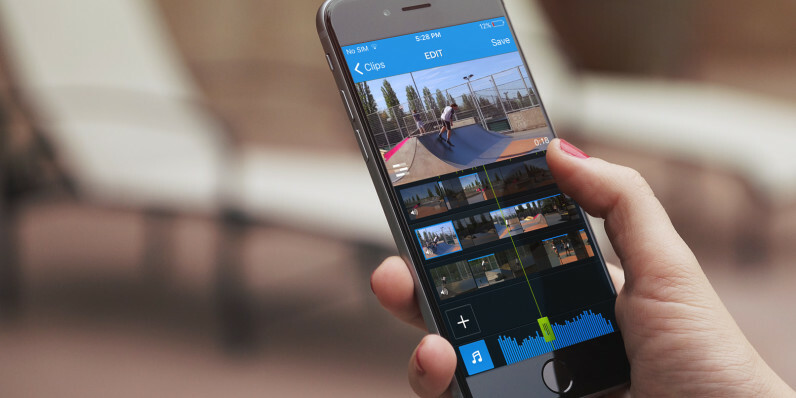 The app is easy enough to use that you can shoot and edit your first video without having to practice beforehand. GroupClip works with up to five people in a single project, and they don’t all have to be in the same place. That means you can coordinate a shoot with friends anywhere on the planet and then splice the footage together on your device, without having to worry about troublesome file transfers. The app is now available for free in the App Store. Additional features will soon become available via an in-app purchase, and an Android version is also in the works.